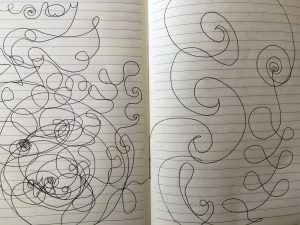 This simple doodling exercise is an interesting way of warming up to writing for wellbeing, and can reveal a surprising amount about our inner worlds, and our relationship with the ‘inner-critic’ that censors what gets transferred from pen to page. Sit comfortably, holding your pen in your hand with a clean page of paper in front of you, and close your eyes. Take a moment to focus on how the pen feels in your hand; we hold a pen to write things every single day but we never stop to pay attention to the feel of it between our fingers; are you holding it tightly, or with a loose grip? Does it come into contact with your hand at the knuckles, or the pads of your fingers, does it rough or smooth, light or heavy? 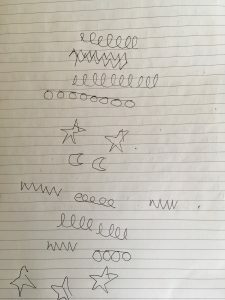 Begin moving the pen across the page, still with your eyes shut, allowing yourself to begin making shapes without plan or judgement – but simply because it feels good to do so. See where your pen takes you. The following doodles are reproduced with permission from recent workshop participants. Upon opening her eyes, this attendee saw herself in this more jagged doodle – albeit in a disjointed way. The jaggedness expressed to the whole group, without the need for words, the kind of week she’d had. The neatly executed, recognisable shapes drawn, even with closed eyes, are testament to the difficulties the illustrator here has in letting go. The critical mind is powerfully dominant, preventing unconscious, more free-flowing expression any space to ‘play’. 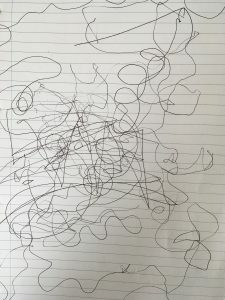 This exercise really is about our capacity to be able to let go of the rules and ‘play’, and also reflects a microcosm of what a Write your Mind workshop is about; trying to by-pass the conscious, dominant mind and get at what lies beneath; our unconscious thoughts and processes, our often-hidden feelings, that can help us to make better sense of who we are.